*sings* We’re all going on a summer holiday…OK. Well it’s November and we’re definitely NOT on a summer holiday. 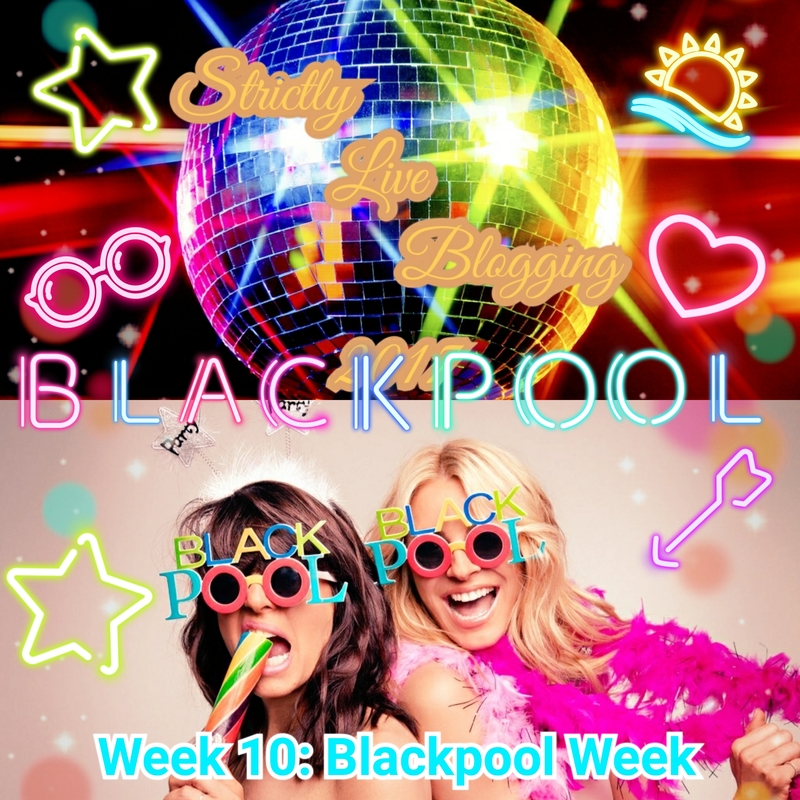 But hey, #StrictlyLiveBlogging fans we are going to Blackpool and that’s good enough for us! Yes we have now reached one of the defining weeks of any series of the BBC’s Strictly Come Dancing as the show goes to the spirtual home of ballroom that is the Tower Ballroom – and we are donning our ‘Kiss Me Quick’ sunhats and lairy sunglasses to bring you all of the Blackpool action in tonight’s live blog. Our warm up is at 6:15pm, with the live blog starting along with the BBC One show at 6:45pm. As always, don’t forget to swipe down or press F5 to refresh to get all the updates as they come in, and to leave your comments below or Tweet us with the hashtag #StrictlyLiveBlogging. Now – anyone for a stick of rock…? 5 minutes to go – and Tower Ballroom is looking as stunning as ever! Let’s bring on the Blackpool ballroom blitz Strictly fans! Wow. It does look glorious doesn’t it? Oooh. We’re liking the circus theme of this group dance! Hoping to rock Blackpool first tonight it’s Mollie and AJ – they’ve got a Charleston tonight, so will she be more of a bird of a paradise than a seagull? Aww bless Mollie’s nan she’s so cute! Oh yes Mollie! Plenty of swivel and sass here! Great song they’re dancing to here as well from Little Mix. Loving the lifts too! Our score: 8. Fun and fizzy Charleston that’s definitely got the wings for success! Shirley said what a way to open the show in Blackpool and that she found her wings – and that she gave some attack and executed her lifts really well. Bruno said AJ let the bird out the cage and said it was like a ride on the big dipper at Pleasure Beach. Craig said there was no turn out in her swivel and said it was clumpy. Darcey said there was a lot of precision in her swivel and her lifts were daring and impressive. Susan and Kevin are dancing next tonight with a Paso Doble based on Strictly Ballroom that Kevin has wanted to do for the last five years on Strictly – so will his patience be rewarded this week? Well you can tell Kevin is loving every minute of being in this character. Susan on the other hand isn’t convincing at all here tonight. I think they may well possibly be in trouble after this tonight. Our score: 5. A dream Paso Doble that turned into a dance nightmare! Bruno said it was somewhere between Penelope Cruz and Craig in panto(!) and that it had great drama and intensity but that she needed to reign it in. Craig said it needed more intent and purpose and the skirt use needed to be stronger as well. Darcey said she felt like Susan was trying to catch up with Kevin but that she sold her flamenco stances. Shirley said there was a nice mix of Paso Doble and that she covered the floor well and did a good job. Oooh, J.K Rowling in the audience tonight! Time now for Debbie and Giovanni – will they bring some girl power to their Spice Girls inspired Samba this week? Debbie making a very convincing Ginger Spice! As for the moves…not much spice in this Samba for me! Not her best dance for me this. Our score: 6. If you wannabe the Strictly winner Debbie, you’ve gotta do better than this! Craig said it was a bit spiky and stiff and needed to be a bit smoother but the timing was perfect. Darcey said she loved her shadow rolls and that the promenade rolls were well travelled but lacked energy at the end. Shirley said she has an amazing vertical line. Bruno said she bought girl power to the tower and that it was a great tribute to pop icons as the Spice Girls! Jonnie and Oti are next up tonight – will they comeback with a dance off defying Tango this week? Now this is more like it from Jonnie! Love the Eurythmics song they’re dancing to this week as well! Sharp, staccato, plenty of attack and verve. One of his best dances I’d say! Our score: 9. Sweet Tango dreams are indeed made of this! Darcey said she thought Flash Gordon had arrived – the attack and determination was all there but that his frame needed to be slightly lower but that he held his shoulders back throughout. Shirley said he needs to work on his posture but that his frame was a bit better. Bruno said he liked the Techno Tango and that it reminded him of the film Tron and he loved how in sync he kept with the professional dancers but that he needs to keep his bum in. Craig said he was leaning over Oti like the tower of Pisa and that it was a bit stompy for his liking and that he didn’t feel he was leading the dance. Gemma and Aljaz are next tonight – having been here on many family holidays, will Gemma’s Blackpool dance dreams come true with her American Smooth? Loving this! So gloriously uplifting this music, this week to a Petula Clark classic! Gemma is exuding joy throughout this with just the right amount of grace and class. Props to Aljaz for his dazzling choreography here too! Our score: 10. A feel good American Smooth that makes you forget all your cares and troubles! Shirley said Gemma did the Tower Ballroom justice and more that she is a great student who listens to Aljaz and that her energy was wonderful. Bruno said she’s moving uptown with this performance, graceful, elegant and that she’s getting better every week. Craig said her pivots were being taken on her toes but that the lines were beautiful throughout. Darcey said there was such control and that she really loved it! Total: 38 and top of the leaderboard! Speaking of 10 Club members, it’s Davood and Nadiya next. Will their Bond inspired Paso Doble be shaken not stirred? Wow. Davood really giving off Sean Connery vibes here! And great Paso – he is leading Nadiya in this dance with good attack, drama and fierceness! Our score: 10. The name’s Ghadami. Ghadami the God of Dance on her Majesty’s Strictly Service! Bruno said it was mission accomplished and that he had a licence to thrill. Craig said he was distracted by his outfit but that it was a powerful performance. Darcey said the sparks were flying between them and that the shaping was strong. Shirley said it was a dramatic performance from a masculine man! Alexandra and Gorka are next tonight with their Quickstep – will they be in the money after this dance? Oooh. Have to say this has more character than her Argentine Tango did last week – looking very much like a 30s/40s film star with all the same glamorous history of this historic ballroom! Our score: 9. A quickstep that was definitely on the money! Craig said there was a bit of gapping at the end but that there seems to be nothing she can’t do. Darcey praised Gorka’s choreography and also her topline as effortless. Shirley said she loved the musicality of the routine and that they connected together well. Bruno said it was like 24 carat gold and that the style, detail and accuracy was effortless. Total: 39 and top of the leaderboard! Closing the Blackpool blitz tonight are Joe and Katya – will their rave inspired Salsa be ride on time? Well you wouldn’t think Joe was the celebrity would you? He’s selling this dance so well and interacting well with Katya and all the dancers here, strong shaping and real presence. Bringing the party/rave too! Our score: 8. Let’s go back to the 90s with Joe and Katya for a dance extravaganza! Darcey said the energy and attitude was exciting and that he did the arm and leg movements were difficult but were phenomenal when he did them. Shirley said he had the most amazing energy and that her lifts were very well done. Bruno said his hips were working well and that he threw in everything and the kitchen sink to the dance! Craig said it lacked fluidity and hip rotation and that he lost balance at the end but that it was quite a routine! That was quite a Blackpool episode was it not! Who was your favourite tonight? Votes are now open and we’ve cast ours. We’ll be back here as always tomorrow for the results with our warm up at 6:30pm, and live blog at 7:15pm. See you then and in the meantime…keeep dancing/live blogging!